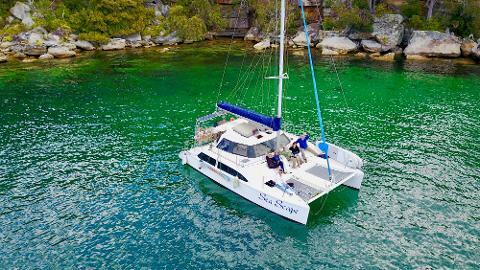 Seascape is a 33ft sailing catamaran, perfect for groups of up to 20 people. Showcasing the best of Sydney Harbour, our crew will take you past all the iconic sights; Opera House, Harbour Bridge and homes of the rich and famous. We then anchor in a secluded bay where you are welcome to have a swim, make use of our onboard Paddleboards, or just relax onboard with a drink. Celebrate any event in style - birthdays, bucks/hens parties, or corporate parties. We offer flexible departure times and locations, and BYO or catering options featuring the best Australian produce. Seascape offers plenty of space, with seating spread around the boat. There is a large undercover table with lounge seating. There are 2 large trampolines at the bow of the boat for sunbathing and relaxing, as well as a full galley, bathroom, and transom shower. There is a great sound system with Bluetooth, and a large BBQ onboard.